Saturday morning I went down to the dock to sit in the sun, soak up some Vitamin D and do some thinking about what’s happening next in my life. Though I usually grab the camera just in case, this time I only took my phone. Why I took my phone I really don’t know. It was early, I wasn’t expecting any calls. In the shallows at the edge of the floating dock a colony of barnacles was eating, flicking their fans out and reeling in that plankton. I carefully held my phone close to the surface of the water to take their picture. The photo came out red – I had my finger over the lens. I slid my finger to the side and … FLIP! … the camera spun out of my hand and into the water. Yes, I did it again. Please someone invent a waterproofing process for cell phones. Though I suppose there’s not much incentive being as how this way idiots like me will keep buying new ones every six months. As I was panicking, drying it off, and trying to find out if I’d killed it, I heard a blow. 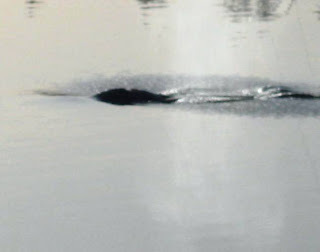 A gray whale surfaced right beside the neighbor’s dock, in about 20 feet of water. I shoved the phone in my pocket and scrambled up the stairs, calling to Tom to bring the camera. He didn’t hear me, so I ended up running all the way up three flights of stairs. By the time I got back the whale had passed, heading south, looking for shrimp along the sandy bottom. I thought I’d missed my chance at pictures, as every gray I’ve ever seen here has followed the shoreline down our west edge of the harbor to the end and then around to the east edge and back north again. But this one broke the pattern by stopping short. There was hammering going on at the local boatyard, would that scare her away? Hammer on steel sheets would annoy a whale exponentially more than it annoys me, and that’s a lot. When she started heading back this way I got the camera ready. You can see a whale’s wake when it’s under water. I tried to take a picture of it, but my little camera wasn’t really up to the task. As she began to surface right between me and Nameless I set myself to take a shot of the blow. Sigh, I’m no Jill Hein. My friend Jill regularly takes fabulous shots of whales. I didn’t have the settings right, so all I got was the last few drops on their way back down, also forgot to zoom. Hope I get another chance to try for a better one of our next gray whale visitor. From the brief glimpses I got, this whale looked to me like a youngish one. Not very big. If I had to guess I’d say no more than 30 feet. But no matter what size, it was wonderful to see one here. 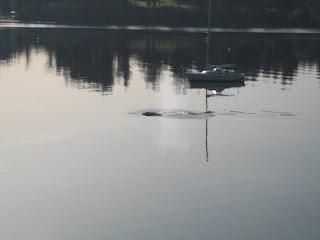 It’s been years since I’ve seen or heard about a sighting in Holmes Harbor. With the exception of the sick one that swam back and forth across the harbor a couple of years ago and then beached down in Saratoga Passage. That was noticeably different and caused concern. This weekend’s whale, I’m happy to say, looked quite healthy. Be prepared, that's this whale scout's new motto. I've become very attached to my camera, hardly ever leaving home without it. But at home, that's another story. A bright side of this escapade – my husband said I need a better camera. I've thought that for a while, but it was nice to hear it from him, now there won't be so much argument needed when it comes time to spend the money. Here's hopin you both get your whale sightings soon. Thanks for reading – and writing. I can't tell you how many times I have wished I had a camera with me. A gorgeous sunrise or sunset, full moon over Deception Pass,clear view of the mountains, or those encounters with wildlife and marine life. 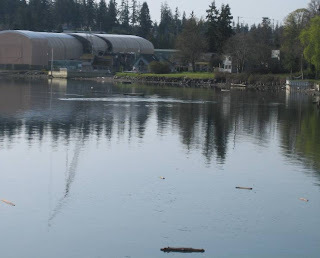 Whidbey is a gorgeous place to live… we are so blessed. I have started buying disposable cameras to leave in the car.